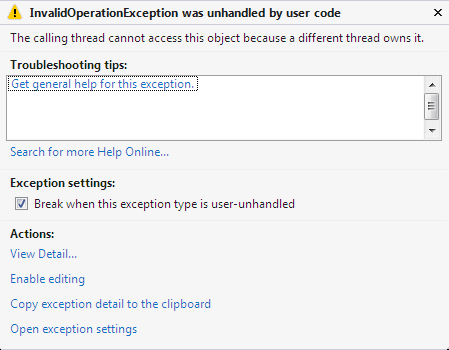 C# The calling thread cannot access this object because a different thread owns it. btn00 is a button control whose value I was trying to set here using async/await as the value was coming over a network call. You may have some other case scenarios also where you’d want to set a control’s property directly from the thread. So to do that we’re gonna use, Dispatcher.Invoke method. This code now works without any glitches.